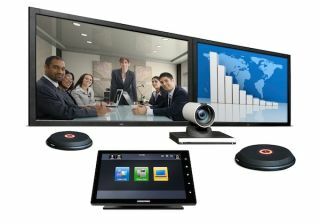 The What: Crestron has introduced Smart Space, a new multi-person, multi-display solution that delivers advanced enterprise-wide communication and HD video conferencing. Developed by Crestron and Cisco to be a complete, open architecture conferencing and infrastructure solution, Smart Space includes an all-in-one AV switcher with control system, touch screen, codec, cameras, DSP – even a built-in program for system configuration and control. The What Else: A repeatable, flexible, and scalable solution, Smart Space is simple to integrate, manage, and maintain, the company says. The code is already written, so no programming is required. Crestron provides the Smart Space pre-engineered program and quick start installation guide to authorized dealers, all at no charge. Simply load the program, use the built-in setup pages to instantly configure the system, and then the customer receives a fully configured and streamlined system that’s easy to use. Smart Space is scalable to allow remote management, maintenance, and concierge services. One More Thing: With Smart Space, users can quickly launch meetings through simple touch screen commands or from the Crestron for iPad app. They can present and communicate via computer with high-quality audio, HD video, and crisp computer graphics to both local and remote locations. Room acoustics for remote video conferencing or local meetings and presentations are automatically optimized via built-in Crestron integration.